Now that the Summer is officially over, I think this last recap post is quite fitting. It’s definitely time to step into a new season. Be sure to check out Summer Recap Parts 1 & 2 – Focused Intention vs. Blind Intention & Learning to Let Go, to find out all of the lessons I’ve learned over the Summer that are preparing me for all aspects of this new season. I’ve realized that a lot of the struggle in change is due to mentality. We desperately want to change, be better, do better, do more, and experience differently. But the struggle comes when we fail to commit to what’s necessary to create the change. The reason it’s so hard to commit is because many times we are still connected to our old mentality. This has been one of my biggest struggles, so trust me, I know all about it. The person who experiences the new and better life does not think or act like the person currently “trying” to change. For instance, the butterfly most certainly does not still think like a caterpillar. I have not once seen a butterfly crawling on the ground or in trees. The only time I’ve seen them landed is when they are perched on flowers or plants for nourishment. The majority of a butterfly’s existence is the opposite of the caterpillar. They have a completely different point of view because their scope is much broader. They are no longer focused on their immediate surroundings, only looking at the details of the ground and the branches that they climb on. Instead, they are able to take in the infinite possibilities of their interesting, beautiful, and ever-changing environment at their whim. Not only is their point of view drastically different, but so are their actions. Butterflies don’t think twice about spreading their wings to fly. They automatically know it’s possible, so they exercise their ability with ease and frequency, as opposed to a caterpillar who doesn’t even think of flying. The distance the caterpillar can travel and the places they can explore are limited to their ability to crawl. They exist without ever going beyond their self-imposed boundaries because they are fully aware of their limited possibilities. This natural process of change is so incredible and beautiful, which is exactly why I love butterflies so much and use their symbolism in everything I do. The butterfly could never fully experience its greatness if it did not first live as a caterpillar with its limited point of view and actions. 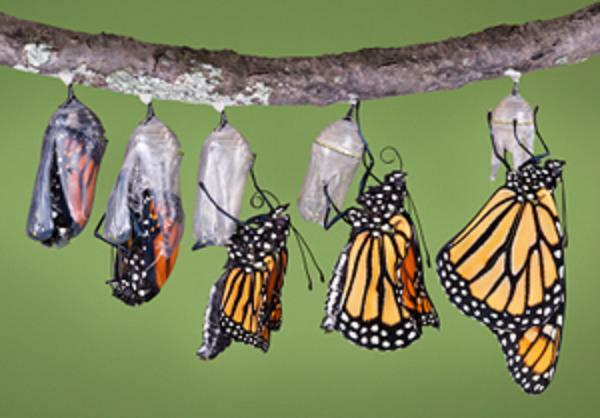 It’s not until they go through the long and tedious metamorphosis, that inevitably ends in the struggle to break free of its old shell, before they are able to take flight with new life. This process is a perfect example to measure your life by as you are making changes. First, if you are currently in your metamorphosis stage and feeling defeated by the struggle, learn to appreciate where you are. This process is for your benefit. Only good can come out of it. You are being prepared with strength, patience and wisdom to be able to handle all the new experiences that come with your new life. Second, take into account the mindset and actions of the person you are trying to change. Pay close attention to your thoughts and feelings. Write them down if you have to, so you can really see what you are telling yourself about yourself and your life. Tally up your negative thoughts against your positive and see which one has the highest score. Determine how many things you do out of habit and why, and then intentionally release all of the things that no longer serve you. Shed your old way of thinking right then and there, and do it as often as possible to keep your old thoughts at bay. Third, step into the energy of who you want to become. When you finish releasing all that old stuff, get out a fresh new piece of paper and write down exactly who the new you is. What does he or she think about? What does he or she do with their day? Would they get freaked out by the same things you do or would they handle them with grace and ease? Are they walking around in circles, surrounded by self-imposed limitations, or are they completely aware of their infinite possibilities and operating in them on a daily basis? When you get the full list of all that your new person does, thinks, says and feels, embody these things as you go throughout your day. Put them on like they are the latest in Fall fashion and show the world you are fully prepared for this new season. This will bring out the NEW you in no time! Any time you start to slip back into that old mentality, just picture a butterfly crawling on the ground instead of spreading its beautiful wings to fly. You’ll think twice the next time and remember your new identity. Share your thoughts in the comments: How have you noticed your mindset keeping you from fully changing your life? What tricks do you have to keep your mind in the “new you” mentality? Great post. Definitely has me rethinking how I think. It’s hard to focus on the big picture sometimes. I know exactly how you feel. That’s why I have to constantly practice these things to make them stick. I love you butterfly metaphor and I’ll be back for more visits! Thanks Sandra! You are welcome back anytime. This post was quite insightful. I used to have a negative mindset in the past. Your butterfly model is similar to what I did to overcome it. Nice butterfly concept. Thanks Lanre. Yeah, it’s great to find creative ways to release negative thinking. Very apt post as I am feeling a bit defeated / exhausted at the moment – which is all part of the process of moving forward into the life I am meant to be living, doing what I should be doing, instead of just living the status quo. Janine recently posted..Where Did the Last 3 Weeks Go? Girl I love this post, it is right on time for me. I have been thinking about how I want to be in the next phase of my life lately and this was right on time. I love your advice and I am going to put it into use. I have been struggling with trying to figure out who I am, who I was and who I want to be. My boys are almost grown and I am trying trying to decide what type of life I want when I am no longer concerned about the daily care of my kids. I don’t want the life I had before I began raising my boys (who are my nephews that I have been raising for the last nine years) but not really sure what a person who is almost middle aged supposed to be and do. Yet, I am so ready to have a life of my own and I don’t want to wait until they are grown to get started. They are both in high school and I feel that it is time to get started. I have lost so much of me, I realize that I don’t know who I really am outside of being a mother and provider. I am going to find out and try to have fun while I do it. Jennifer Woodard recently posted..Are you Preventing Your Current Customers from Becoming Loyal Customers? No I have not read The Alchemist but I will check it out when I get a chance. Could you not agree more with you on “lot of the struggle in change is due to mentality”. I think if you keep your eye on the prize you will get after changing yourself can sometimes really help. Thanks for sharing a great summer round up. You are absolutely right. It is so true that when you keep your eyes on the prize, it definitely helps. Thanks! I really like your post and I could not agree more. Sometimes we just get stuck somewhere, and do not even realize that it is only “us” who prevent “us” from moving forward. The idea to use a butterfly as a comparision is great, and also reminds me of the “butterfly effect” in chaos theory. We all need to remember that even a small change ( in this case in ourselves or our behaviour) can cause larger changes later on. We may be like a small butterfly which spreads its wings and causes a storm somewhere after. That is so true Kasia, about making small changes and the large effect they end up having on our lives and the lives around us. That’s an excellent point, and it adds to the importance of taking the steps to make change in your life, whether they are large or small, they all make substantial effects. Thanks for sharing!